Determination and hard work brings a WW II battleship back on the air. The Other Woman — that is what she has become known as, at least by the wives of those seduced by her charms. She is high maintenance to say the least. She is a large, strong lady, with an unmistakable profile and an insatiable need for attention from people to make her look good. She is one of four sisters, called the Iowa Class Battleships, and she is known to her friends as “Big J.” She is the ex-USS New Jersey, berthed now in Camden, New Jersey, doing duty as a museum and memorial. Conceived in the late 1930s and built during WWII, the four Iowa class ships were, at the time, the most advanced collection of technologies then in existence. Ship construction, weaponry, radar and communications were all state of the art for that time and many years thereafter. Three football fields long and 15 stories tall, she dominates the waterfront. This is the story of how she acquired a new voice. NJ2BB — The perfect call sign for the ex-USS New Jersey battleship, hull number BB-62. It was through the foresight of Joe Duffin, W2ORA, that we have this call sign to use by the Battleship New Jersey Amateur Radio Station (BNJARS) — pronounced “Bean Jars” by some. When Joe became aware of a plan to bring the battleship to Camden, he applied to the FCC for the call sign, assuming that like most other historical ships, the New Jersey would have a ham station. At the same time Peter Greene, N2LVI, and Joe Cramer, N2XYZ, separately and unbeknownst to each other, decided to form a ham club for the ship. When they became aware of each other’s efforts, they got together with a cadre of interested hams and non-hams to create what was to become the Battleship New Jersey Amateur Radio Station. There was club stuff to be worked through, but everyone was mostly interested in getting to work. The ship came home to the Delaware Valley on Veteran’s Day 1999, towed from Bremerton, Washington through the Panama Canal by a Crowley Marine seagoing tug. On that day both shores of the Delaware River from Delaware Bay to the port of Philadelphia/Camden were well populated with spectators. A flotilla of small craft and US Coast Guard vessels followed in the wake of the huge ship as she and the tug made their way upstream. She was first temporarily docked at the Philadelphia Naval Business Center, formerly the Philadelphia Navy Yard, from where she was launched on December 7, 1942. After a short stay, she was moved across the river to a berth at the South Jersey Port Corporation in Camden, New Jersey. She would reside there for 9 months while hundreds of volunteers, including the radio gang, swarmed over her, doing the innumerable tasks needed to make her functional, safe and presentable to the public. It was decided early by the original curator, Scott Kodger, that the ship would be presented in her 1990 configuration and as much like a commissioned ship as was possible. Restoration to her original appearance would not be possible because of past US Navy major structural modifications. 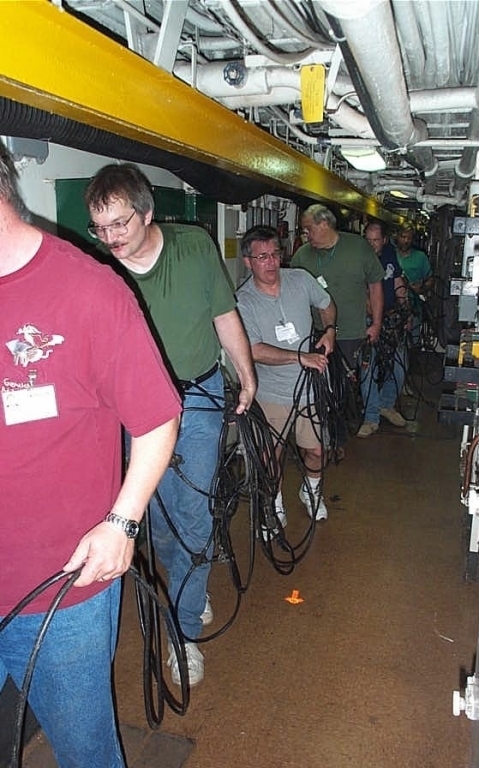 Every attempt would be made to restore the communications systems to working condition and all work would be done “Navy style”— no haywire repairs allowed. Most of the communications gear dated from the ’70s and ’80s and, at the time of decommissioning in 1991, she had a mix of HF teletype, satellite digital radio and assorted VHF and UHF systems. When a ship is mothballed by the Navy for long-term storage, everything that is removable from the exterior of the vessel is dismounted and put inside including all antennas. All usable and classified gear is removed. The heartbreaker is much equipment left on board was demilitarized. “Demill” meant that it was disabled and made useless for resale by cutting wires and sometimes by working over the face of the equipment with a hammer. To see otherwise good gear in this state was discouraging but challenging. The most important system to bring back on line immediately was the 1MC, the ship-wide announcing system. While not actually radio, it was vital to “pass the word” and is more than just a mike and an amplifier. It is a crucial part of shipboard operations and has 2500 W of solid-state amplifiers, 1000 speakers, hot spares, microphone and loudspeaker controls. The 1MC is used for alarms and everyday or emergency instructions to the crew. There would be no working telephones for some time as the old PBX had met with the wire cutters and hammers big time, leaving the 1MC as the only method to contact people aboard. Hams thought “Why don’t we all carry handheld radios?” With every compartment a complete steel box, RF has a very difficult time getting around. With hundreds of compartments, the 1MC would be the only way to pass information, locate people or sound alarms and had to be up and running immediately. BNJARS volunteers spent many hours repairing the demill damage. In less than a month, announcements such as “Now, all hands lay to the fantail” could be clearly heard on all decks. We were by turns very cold and very hot during the renovation, especially in Radio Central. Summer was as hot and humid as New Jersey can get, with no fans, much less A/C. In the first winter we looked like clones of that French tire company mascot, what with all the layers of clothing. In summer, every layer legally permissible was removed and minimally helpful fans brought from home. Radio Central, the focus for most exterior (RF) communications, was the next project. 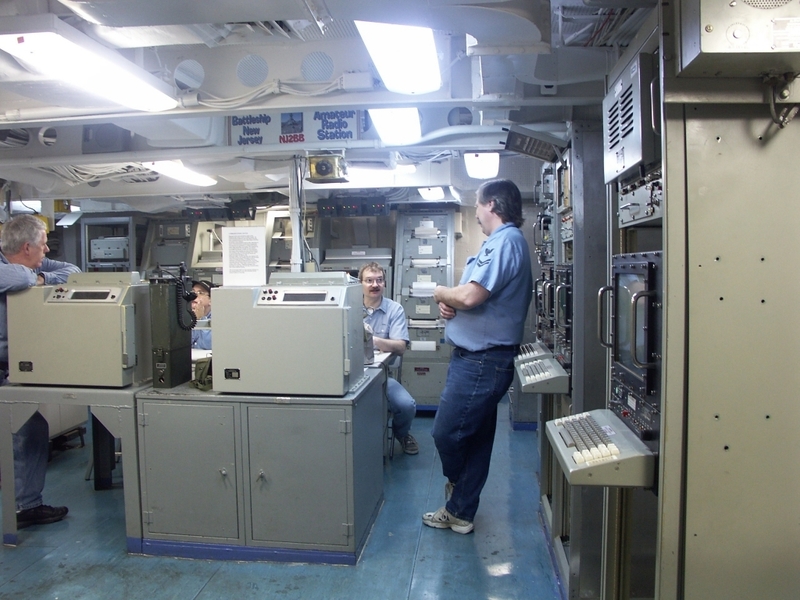 The Navy differentiates “Exterior Communications” from “Interior” with the latter being telephones, intercoms and many signaling and indicating devices. The radio room had empty equipment racks, a deck crowded with the dismounted heavy fiberglass vertical antennas, a couple of banks of disabled teletype printers and not much else. The wires and insulators for the broadband 2-6 MHz fan dipole antenna, the bow mounted 10-30 MHz discone-cage and the aft mounted 10-30 MHz truss vertical were found three decks below, snarled in a huge ball stuffed into a small space outboard of the transmitter compartment (see Figure 1). It took a conga line of radio crew strung along the passageways to move the long bundle of heavy gauge bronze wires, still bolted to many long, weighty metal and ceramic insulators (see Figure 2). The fiberglass vertical antennas were moved to exterior decks, checked over, hardware found and repaired if necessary. Those we could not install ourselves were left for riggers. There was much work just to get Radio Central cleaned up and available gear moved to correct locations. Moving heavy gear through the passageways and up or down ship ladders is hard work, especially for a bunch of not very athletic hams. Hand trucks are useless as every 10 feet the load had to be lifted over the sills of watertight doors. Vertical rigging was needed for the ladders between decks. Bad enough in winter, but in the hot weather with no air conditioning, it was just plain old grunt and sweat. Dave Burgess, WA2TVS, Margaret Burgess, KB2BRR, and John Goheen, KB2ADL, located the ammunition magazine below decks where documentation had been stowed, so we were able to find information as to what was supposed to be where, even if we didn’t have the gear at the time. Fortunately, Uncle Sam saved almost every piece of paper ever used aboard. Research from these documents and manuals established proper antenna locations, matched up the correct couplers and accessories, and located the coax runs. Some rearranging of the feed lines was necessary as the Navy had located the receivers on one deck and transmitters on another. Patches and cross-connects were made to terminate the feed lines in the ham shack. Fortunately, the Navy uses embossed metal tags on the end of every wire, so it was relatively easy to identify them. Since radio teletype (RTTY) had been a major part of naval communications from WWII on, the New Jersey had several pieces of these electromechanical marvels aboard, mostly intact. Ed Clark, W2KP, had been a US Navy teletype technician and was indispensable in adjusting and repairing the complicated equipment. When a visitor to Radio Central breaks a light beam sensor, a teletype machine starts and clatters out a printed message read from a loop of perforated paper tape. A former cryptology space behind Radio Central was designated as the NJ2BB ham shack. It had only a couple of empty shelf racks so operating benches were constructed, feed lines identified and brought out through a patch panel to the new operating positions. Power, HVAC and lighting were also attended to. The BNJARS station now has five HF (see Figure 3) and one VHF/UHF position, all equipped with ham equipment donated or on long-term loan and running most analog and digital modes. The most recent addition is a Harris URR-119 and its companion 500 W remote controlled autotune amplifier, which allows us to operate military radio from the NJ2BB shack. The ship is moored in the Delaware River. The mooring has no nearby residences or businesses to either make noise in our receivers or be bothered by our transmitters, making it an excellent RF location. The shack is basically a closed metal box, and the steel ship, floating in the water, provides a near perfect ground. Even the power lines into the shack are equipped with RF filters because with operations on several frequencies simultaneously, the Navy needed serious isolation, grounding and filters to insure that RF stayed where it belonged. The HF antennas are broadband and like the V/UHF radiators, mounted high and clear. With the Navy antenna matching panel in operation, we put out good signals on all bands with average ham rigs. Saturday is usually ham radio workday. Dave Burgess, WA2TVS, was elected “Chief Engineer” and coordinates a list of needed chores and mostly lets whoever has the know-how and interest to take ownership of various projects. By adhering to all safety regulations and being helpful with non-ham chores onboard, the radio gang pretty much has the run of the ship. A non-ham member, Gene “Captain Gadget” Furmanski, has been instrumental (pun intended) in activating much of the dead equipment. Not all of the old gear can be restored to operation, nor is it necessary, but to provide a living museum atmosphere, these devices have operating dials and lighted panel controls. Another clever bit of eyewash was perpetrated by Bill Bacon, KE2XC. There were monochrome CRT monitors in Radio Central for the digital satellite system. It was not possible to duplicate the actual Navy displays, so Bill replaced the original CRTs with used retail point-of-purchase displays (see Figure 4). Signals from a 2 meter APRS receiver provide live, if not historically accurate, scrolling text. The Navy has an Inactive Ship Maintenance Facility for out of commission ships at the old Philadelphia Navy Yard. Historic ship organizations are permitted semiannual access to remove usable items. The BNJARS group takes advantage of this to unbolt, cut loose and rip off whatever could be used aboard The Big J, radio related or not. The former heavy cruiser USS Des Moines particularly contributed many intact WWII era radios. This way many pieces of gear were acquired to fill in the communications suite. Occasionally, Murphy is away and Lady Luck is aboard so equipment is sometimes found in clean and working condition. In late 2009, most of the correct gear is aboard and on display or in actual use. NJ2BB is operated by BNJARS for visiting hams and as a teaching scene for youth groups of all kinds, JOTA, the Scout Jamboree On The Air, being one of them. The annual Historic Museum Ships on the Air event is another operating highlight featuring contacts with historic ships worldwide. The Curatorial Department has created some 1940s historically accurate presentations. One of these is the WWII era radio room, located on the third deck, just aft of the number two 16 inch gun turret. Prepared and equipped by the BNJARS crew, this compartment is on a tour route and is on the air for special events. BNJARS has acquired considerable older radio gear. Mostly of it is in good shape but all is in need of some TLC, which often requires an understanding of vacuum tube circuits. John Saracen, WB2DFB, has excellent and broad experience that includes the vacuum tube era and he has been able to revive receivers and transmitters from the ’40s. Some of these resurrections required imagination as well as technical skill because some 1940s era parts are, not surprisingly, unavailable. Radio and communications work aboard the Big J continues. The battleship needs constant work to keep her in tip-top condition. She is likely the most “in commission” appearing historical ship on public display. It is also likely that the Battleship New Jersey has the most complete, operating and correct radio and electronic systems of any museum ship. Little aboard, including the big guns and propulsion plant, has been permanently disabled so she, that “Other Woman,” provides an excellent example of a United States Navy battleship and is a great source of satisfaction and enjoyment for those who keep her looking good. The Radio Crew has so far invested 33,000 volunteer hours, while the total for all kinds of volunteers has passed 500,000 hours. The Battleship New Jersey Museum and Memorial as an organization has benefited enormously from the unpaid efforts of these dedicated people. The Radio Crew of NJ2BB, their work with the communications systems and help with other aspects of the ship, have contributed immeasurably to the restoration of this amazing vessel (see Figure 5). Visit the BNJARS Web site and read the Guest Operators section for the rules and contact information to arrange a visit and to view many more pictures of the BNJARS gang at work and the Battleship New Jersey herself. For those hams and others interested in visiting or operating from the BNJARS shack, a Saturday visit is best but other days are available. A visit to operate NJ2BB is free but does not include a ship tour. All visits should be arranged at least 1 week in advance so BNJARS can insure a control operator being on duty. Most of the Radio Crew still have day jobs so Saturday is the best day for an NJ2BB shack visit. The 2010 Museum Ships Weekend is June 5 and 6. See BNJARS for detailed list of ships. All photos by Margaret Burgess, KB2BRR. Douglas McCray, K2QWQ, an ARRL Life Member, was first licensed as KN2QWQ in 1955. From then until 2004 he was very active in both RACES and ARES® in southern New Jersey. He is active on HF and especially enjoys 2 and 6 meter CW and SSB when not on the local repeaters. Douglas started out in broadcasting before spending 3 years in the Army. After leaving the service he worked in facilities and electronic manufacturing management, which culminated with a 7 year stint working on the Battleship New Jersey. Douglas enjoys troubleshooting and repairing just about everything and currently has a home business called “The Heirloom Doctor, LLC,” for the repair and restoration of personal and family treasures and mementos. Douglas can be reached at 919 Cranbury Cross Rd, North Brunswick, NJ 08902-2238.